And so ends an era. Johnny Cueto was traded to the Kansas City Royals today for three pitchers; the most notable being Brandon Finnegan. It’s funny – we had this blog going when Cueto began his Reds career. They were coming out of the darkness, over a decade of futility. You knew you were on the ride up. Today, it’s like the organization admitting that this current core and guys on the 25-man roster will never win a title or play in a World Series. I mean, it was official before today of course. But this makes the probability meter of that ever happening absolute zero. Right down to the very end; right down to his very last start as a Red, Johnny Cueto was awesome. We kind of eulogized him after his gem in Washington a few outings ago. The bottom line is he’s the best homegrown pitcher the Reds have put in a uniform since Mario Soto. 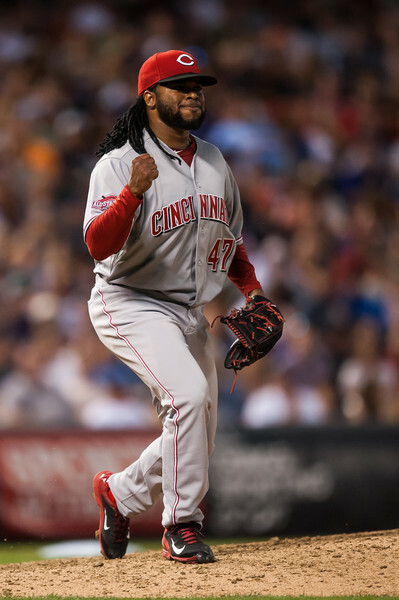 Who knows when we’ll have another true ace like Cueto or how it will go when it happens. I may be a very old man. It’s really hard saying goodbye to the players you love, the players you’ve grown so attached to. The players you’ve spent so many evenings in your living room living and dying with through the eb and flow of a baseball game and season. While the Reds prepare to mire in obscurity, Cueto will write a new chapter and start more games in the postseason and probably reach incredible heights yet in his career. The book on this chapter has sadly closed. I’ll really miss Johnny Cueto. ← Previous Story Jay Bruce’s last (Cincinnati) ride?